After all, outcasts of a feather should stick together...even until the end. Thanks to a lucky streak, I've discovered a few fantastic indie reads lately, and Nameless by Mercedes Yardley is a shiny star among them. It is a dark and edgy mix of genres, a novelty both in urban fantasy and in horror. As an author, Yardley makes her own way, leaving behind all well-worn paths and familiar tropes. If you think we've seen it all, think again. With Nameless, surprises are around every corner. Nameless came to my hands entirely by accident. I so rarely accept random review requests these days, but I've heard a great many wonderful things about Ragnarok Publications and I was determined to give them a chance. After reading Nameless, I'll never hesitate to buy one of their titles again. Luna Masterson has been seeing demons since she was a little girl. She inherited the horrible ability from her father, a wonderful, yet tortured man who killed himself years ago. Luna and her brother are all alone, and they live together in Seth's house and raise Seth's baby daughter all on their own. Luna is far from your average heroine. She is headstrong, prickly and extremely difficult, but the amount of sympathy she provokes makes all her faults instantly forgivable. Despite being a bit hard to like at times, Luna is a character I had no trouble understanding. Her awful temper and solitary ways are a direct consequence of her ability, and she's always quick to hurt those she cares about before they get a chance to hurt her. The secondary characters are every bit as strong and well-developed as Luna herself. The moment Luna meets Reed Taylor, it's clear how important he'll become in the overall storyline and his character is developed accordingly from the start. Their relationship did feel a bit like instalove, but it was so multi-layered and messed up that the term simply didn't apply. My favorite character by far, though, was Mouth, a demon determined to help Luna in any way he can, even if said help was less than welcome. In order to accept and even befriend Mouth, Luna had to overcome years of ingrained prejudices, but she did it in her usual prickly and obnoxious manner. It should be said that the elements of horror become stronger as the story progresses and that the final part is especially gruesome and disgusting. But even if you're not a fan, trust me when I say it's worth it. The emotional impact this book had on me is a rare and beautiful thing and I doubt it would fail to touch any of you. There were a few minor problems I cannot talk about for fear of spoiling the delightfully unpredictable plot. Some very important moments felt rushed and not properly explained, and the choices some characters made (one character in particular) seemed far too extreme. There was also the small matter of Luna referring to Reed Taylor as 'Reed Taylor', name and last name, every single time*, which certainly took away from my reading enjoyment and threatened to drive me bonkers. 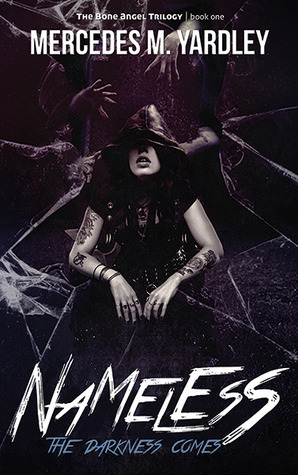 That said, Nameless is a read not to be missed at any cost and Mercedes Yardley an author who will surely give us many more exciting reads. *I call this an estepism after Jennifer Estep, who used to do the exact same thing with her character Donovan Caine. I am really convinced about picking this one up after reading your review! Oooooh, this sounds like a fantastic read! Adding it to the TBR list for sure now! Thanks for your great review and the great books you discover for us! You have definitely piqued my interest with this one Maja. I think I need to give this author and book a try now. I'm right there with you in not accepting many review requests (mostly because I have too much to read as it is) but I love when one comes out of nowhere and really socks you a good one! Always a good sign when the secondary characters are as well developed as the first. I think Chuck Wendig was talking about this book on his blog, so it must be good. So glad to read a good review of an indie, and your review makes me want to run out and get this one. Thanks Maja! Maja you certainly have me curious, I love both UF and Horror so the blending of the two is something I would enjoy. You made me giggle about the Reed Taylor thing..that would get me too, even though you mentioned some issues it looks like they were minor. Wonderful review! "It should be said that the elements of horror become stronger as the story progresses and that the final part is especially gruesome and disgusting." And on that note, I'm going to take a pass on this one Maja! I'm just way to squeamish to tackle it I think, though I do love the sound of Luna and Mouth. I want to know all about his less-than helpful help:) Glad you took a chance on this one and it paid off, it's so fun when that happens! So great to find awesome indie authors! warms my heart right up as well. Never heard of this one :) but thanks for bringing it to my attention cause the story sounds good. I saw that it has demons and it made me giggle. Lately everything has them in it, but I am okay with that! Never heard of this one, Maja, but it sounds like a terrific Halloween read. Thanks for putting it on my radar. oh it's so wonderful to discover some new authors and books like that and well like that you make you me discover them as well so thank you. I didn't know this one at all but you made me curious. And it's great to have secondary characters well developped too. Not often the case. Ooh I'm loving that cover! This one sounds fantastic. Thanks so much for your review. I'm glad you liked it overall, and I'm a huge fan of books where the secondary characters are full and well-rounded. Oh no, Heidi, I know you. You'll handle this one easily. Oh awesome! I've been seeing this one around and it's been catching my every time. I love the sounds of it. And by what you say, a winner to get. :) Thank you! I hadn't heard of this one before. I don't know about the gore and stuff, but if it's worth it, then I can handle it. It's kind of nice to find a book that not many know about that's a real gem!